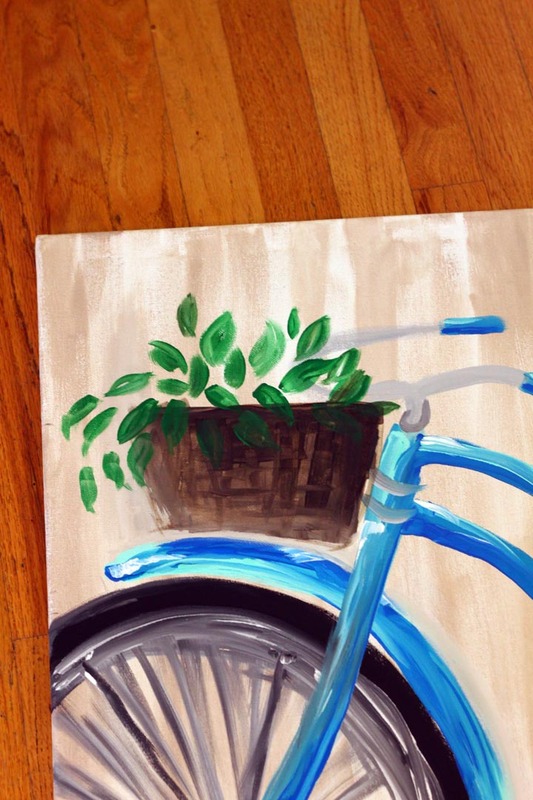 Create your own beautiful wall art with these step-by step directions. 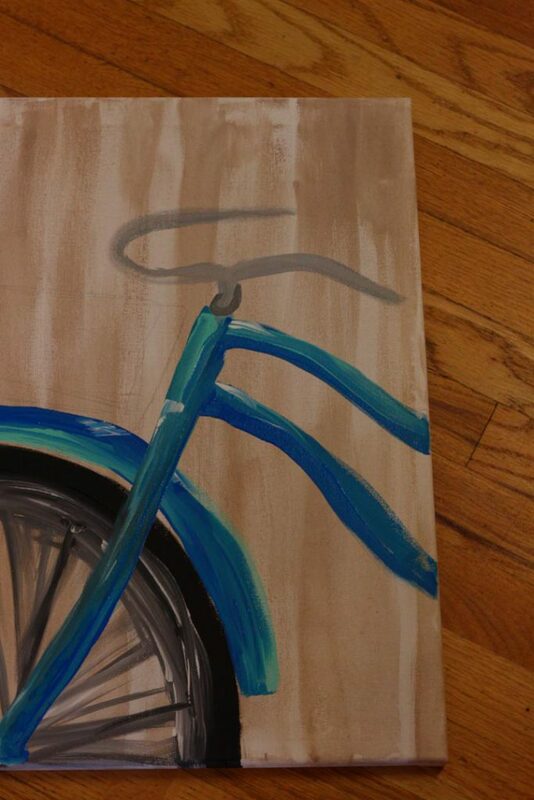 To begin, we’re going to mix our background color. 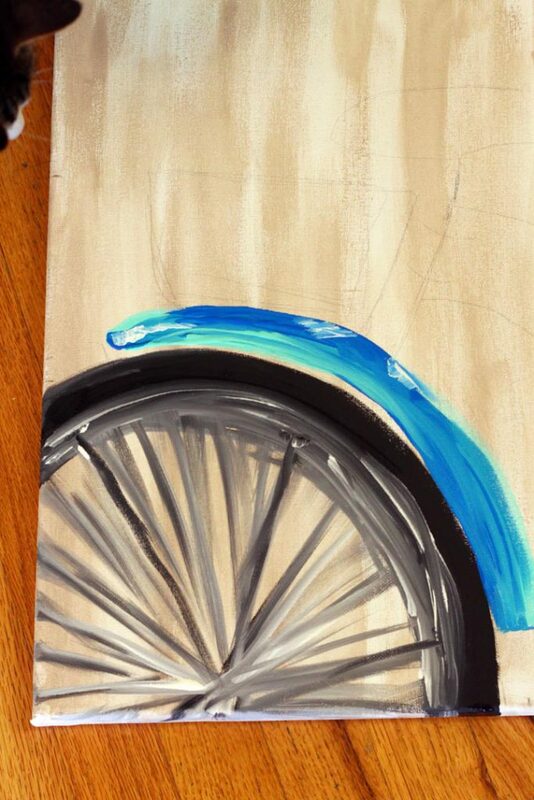 For the background, we’ll use the widest flat brush–the 1-inch. 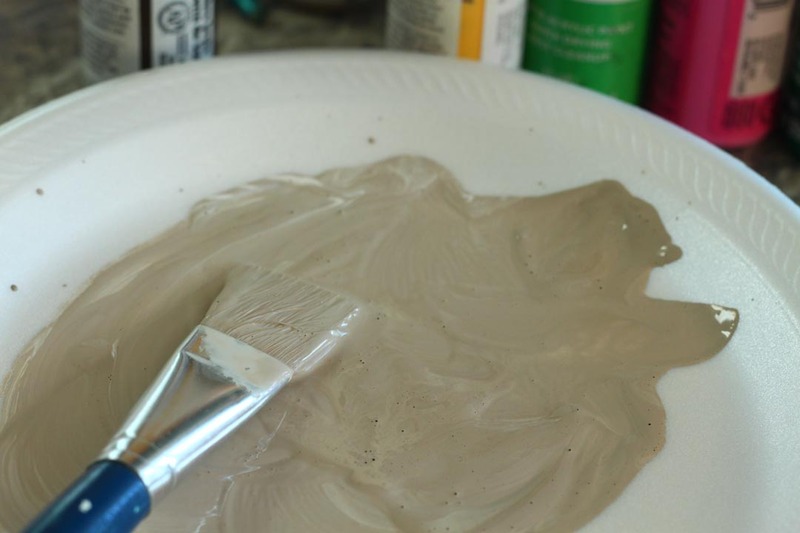 On your pallet, mix some Khaki Tan paint with some water, until it is the consistency of heavy cream. Rinse your brush, and blot it dry on the paper towels. Pick up a bit of paint on your brush, and begin making fast, brushy vertical streaks down your canvas. 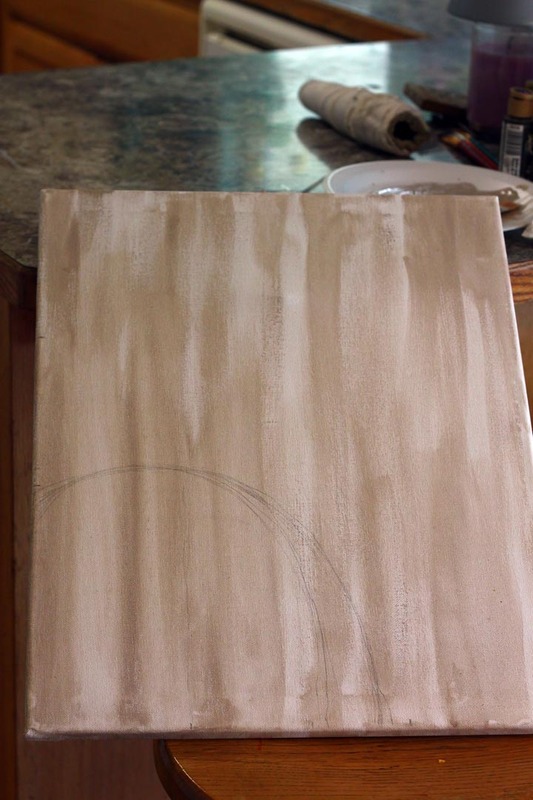 Wet your brush a bit, and blend as you go, until you get a pleasing streaky background–don’t just totally coat your canvas, let some white show through. 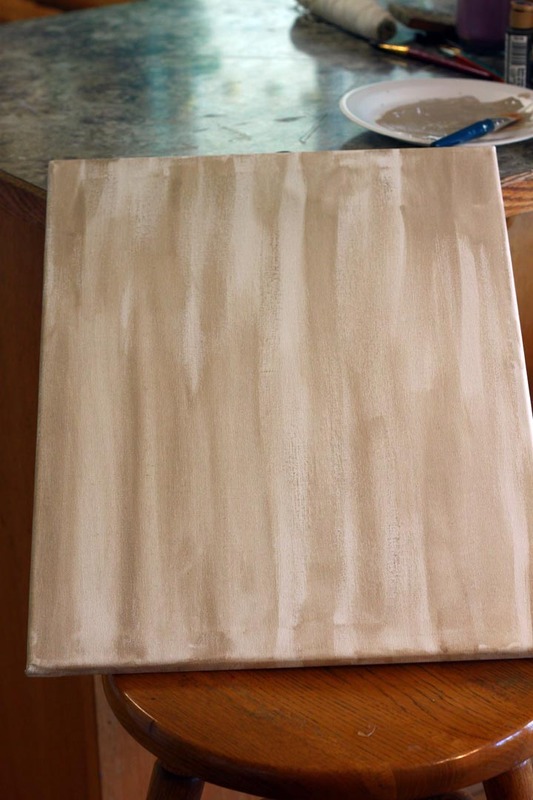 You can always wipe away paint with some paper towel, if you apply it too heavily. Be sure to paint the edges as well. Let dry. Print the Bicycle diagram to refer to when drawing. Using your pencil, make small marks to divide the edges of the canvas evenly into thirds–in the Bicycle PDF diagram, these lines are red. Use these marks to draw VERY LIGHT grid lines with a pencil onto your canvas. Then mark half-way on the vertical edges–this line is green on the PDF diagram. Using these dividing lines, and the PDF diagram, lightly sketch in the basic components of your bicycle, as shown. You need only draw your bicycle in single pencil lines to guide you–we’ll make them thicker with the paint. 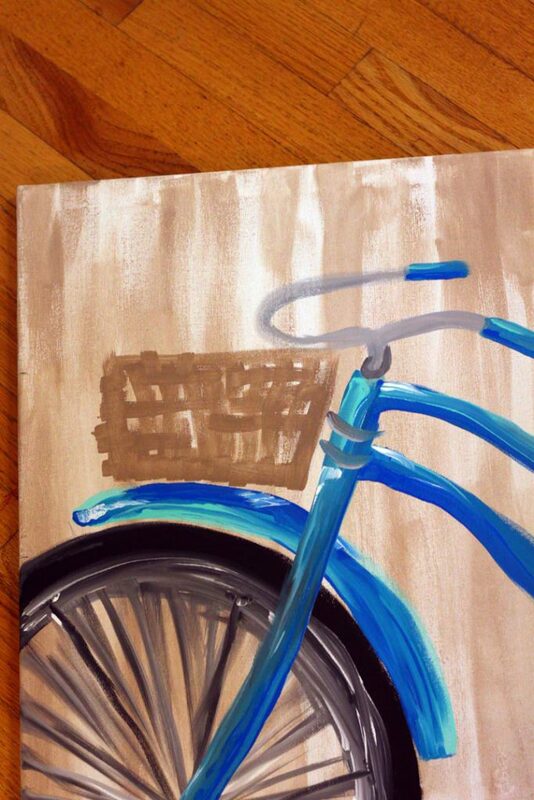 After you have drawn your bicycle lines in pencil, erase any remaining grid lines from the canvas. Using your 1-inch brush, and Ebony Black paint, begin painting the tire. The tire should be about 1-inch wide. 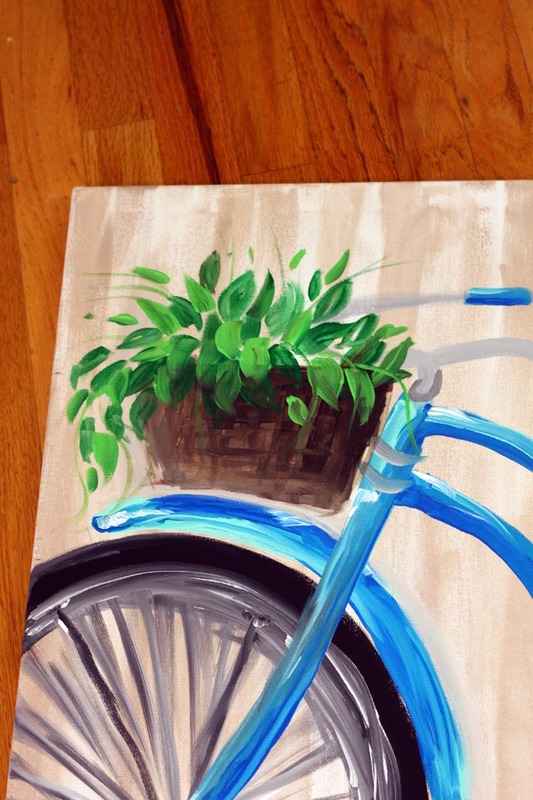 Keep your brush strokes loose, and brushy. 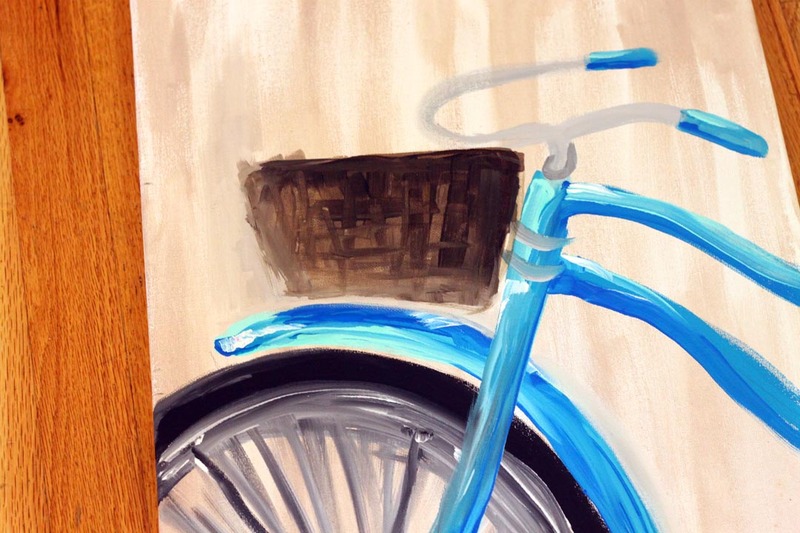 Loose, and brushy strokes are the name of the game with this painting–we’re not trying to make a photographically correct picture of a bicycle, we’re trying to create an artistic idea of a bicycle. While the Ebony Black is still wet, load your brush with a bit of Snow Titanium White, and begin blending the inside of the tire to create the greyish inner edge of the tire–your tire in it’s entirety should be about 2-inches wide. Keep your brushstrokes loose, and don’t overly blend the paint–streaks of color make it more visually interesting. 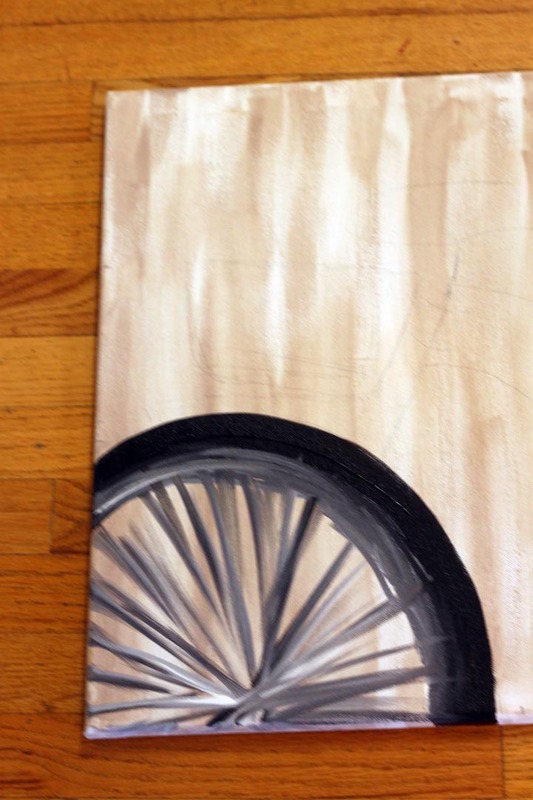 Note where your pencil mark on the bottom edge, closest to the left, is located–this will be the center of the wheel where your spokes will angle in to meet. 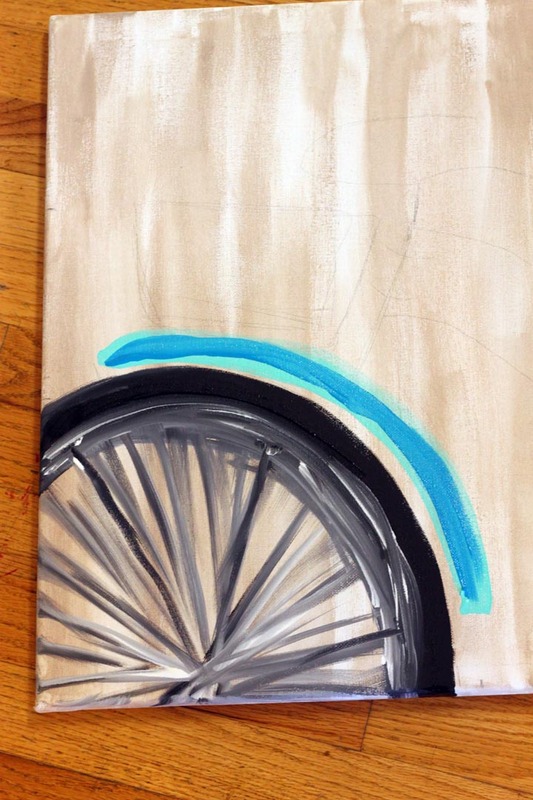 While the paint is still wet, use the skinny side of your flat brush to pull the still wet gray paint down from your tire, into the center of the wheel–make quick, brushy strokes to create thin lines representing spokes. Try not to make the spokes too even, and don’t worry if they’re even full lines–just make sure they’re all angling correctly into the center. 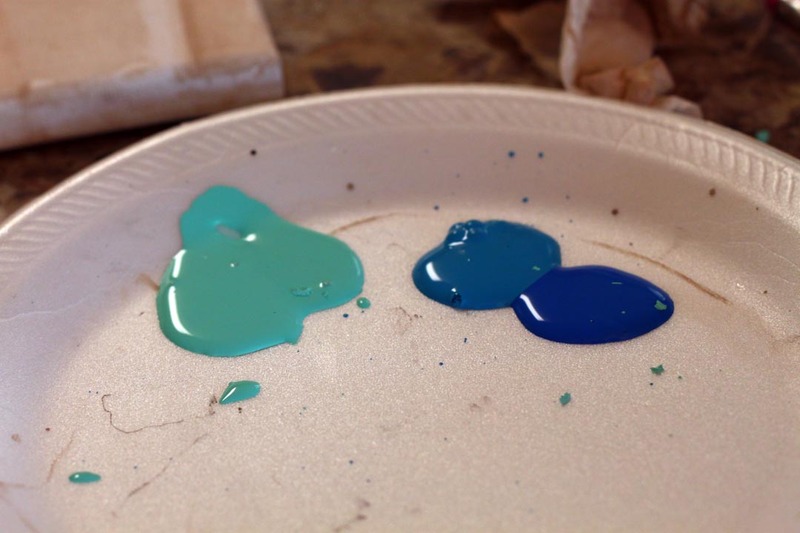 Next we’re going to use the Sea Aqua, Desert Turquoise, and Wedgewood Blue. Using your 1-inch flat brush in the Sea Aqua, paint the top fender of the bicycle tire–it should be about an inch wide, and curve right along the top of the tire, not quite touching it. The fender sits on top of the tire, leaving around two inches of bare tire on both ends. 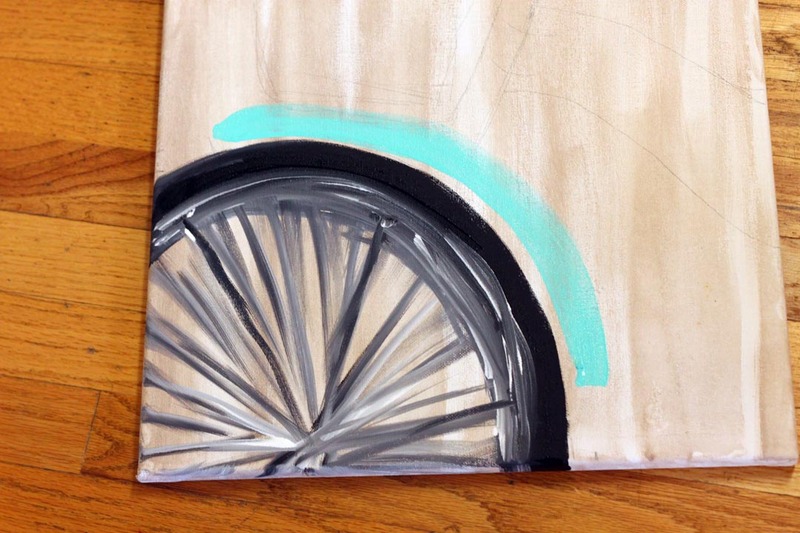 Working into the wet paint you just applied, load your brush with Desert Turquoise, and begin adding your medium tones to the middle of the fender. Keep those strokes brushy, and don’t over blend! 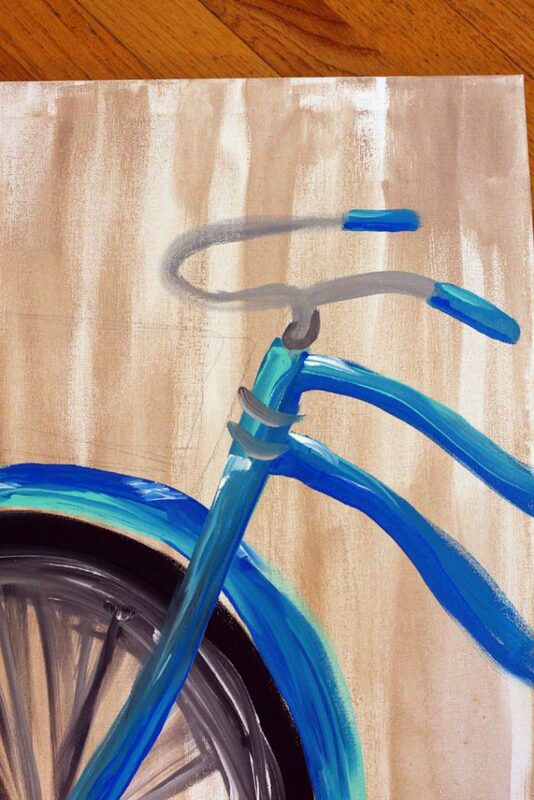 Still working into the wet paint, load your brush with Wedgewood Blue, and add the darkest shadowy areas onto the fender–at the top of the fender where the basket will cast shadows, and along the lower portion of the fender, where the rest of the bike will cast a shadow onto it. 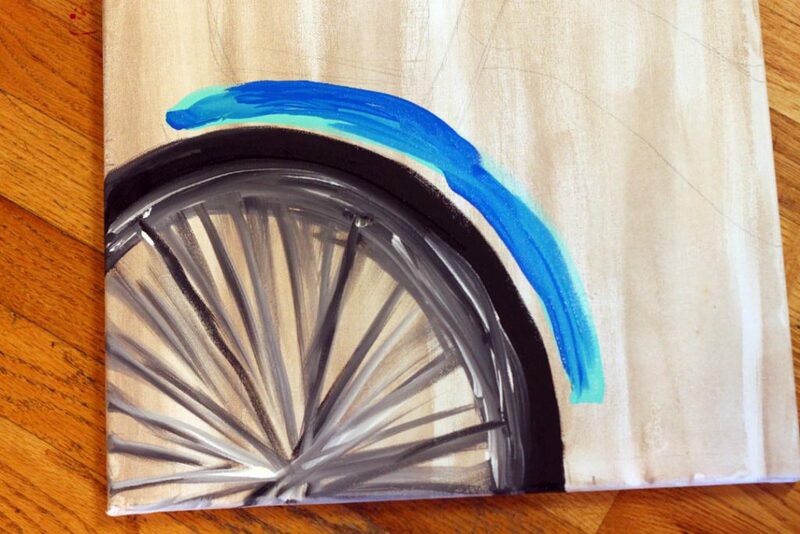 Again into the wet paint, load your brush with Snow Titanium White, and add a few highlights to the fender–right at the front, near the top of the curve, and down the curve just a bit. 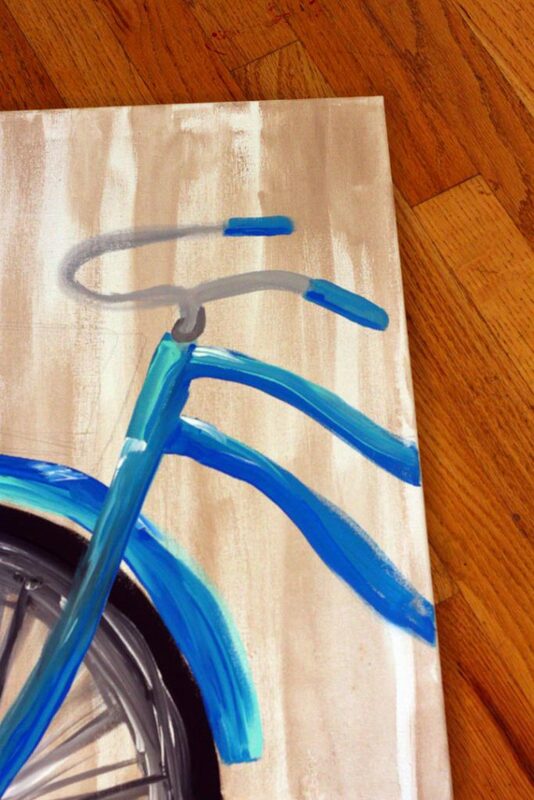 To make the central post of the bicycle, load your flat brush with Sea Aqua, and paint an inch wide stripe. My black still wasn’t quite dry, and bled a little into the aqua, but don’t worry if yours does, it just adds some character. 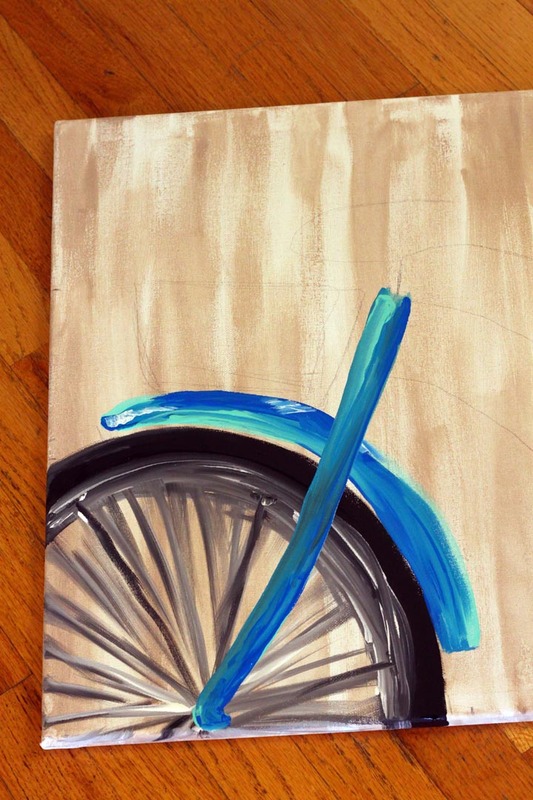 Next, load your brush with Desert Turquoise, and brush up the middle of the stripe you just made, to add some depth. 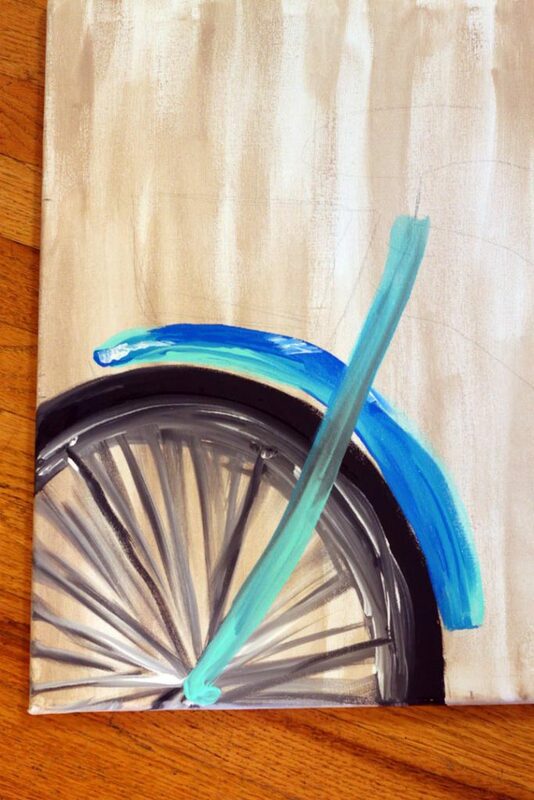 Then, using your Desert Turquoise, brush inch line stripes of paint onto the two sloping body piece. Highlight both the front of the central post, and the tops of the sloping side pieces with some more Sea Aqua. Shadow the opposite sides with the Wedgewood Blue. Mix some white and black together until you get a medium gray. 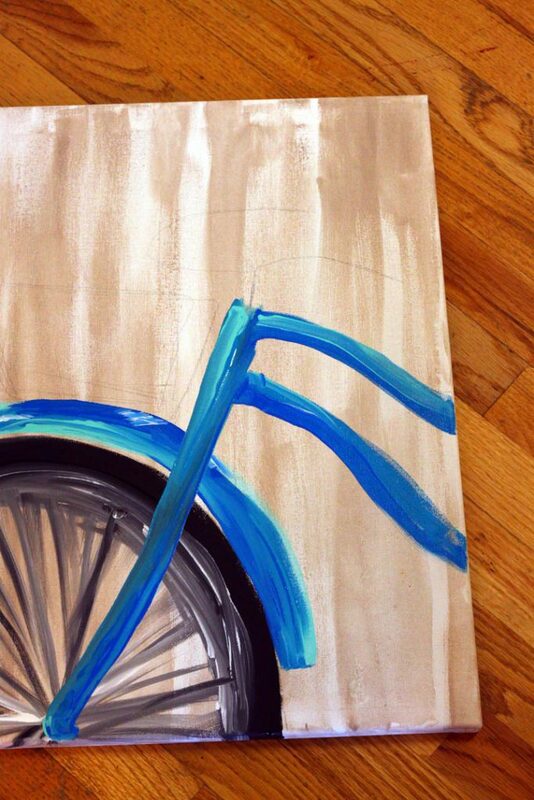 Using a flat 1/2-inch brush, paint the handlebars. 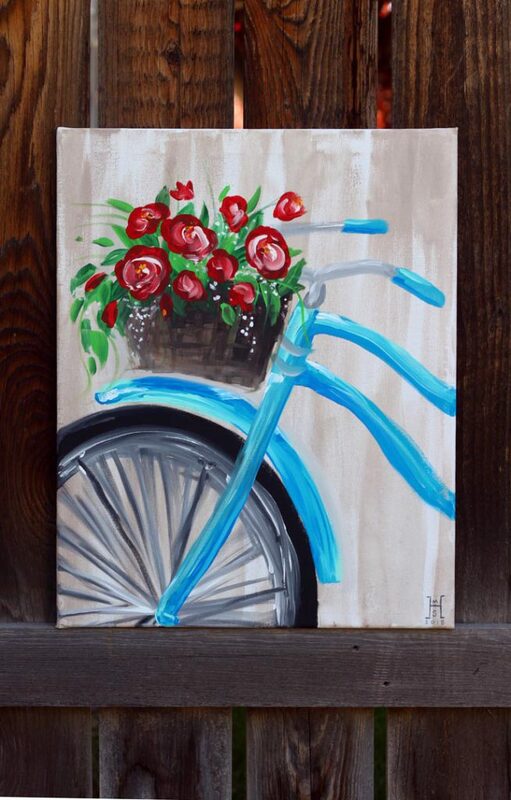 Use the Desert Turquoise to paint the bike handles, highlighting the tops with Sea Aqua. Add a touch of black to your medium gray, to make a dark gray, and paint a “U” shaped bit around the post of your handlebars, as shown. Using the same dark gray, make two quick swipes on the central post, between the two body pieces, to create your basket holder. 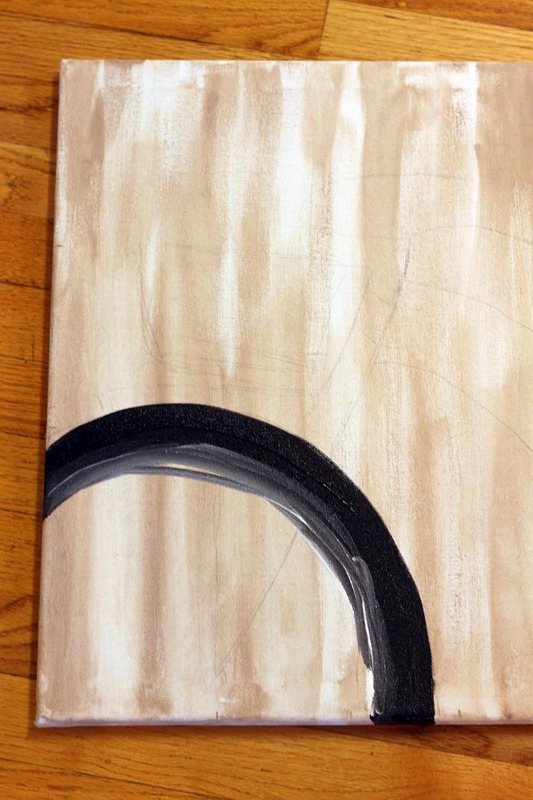 Using your 1/2-inch flat brush, load the brush with a bit of Khaki Tan, and quickly sketch the edge of your basket. 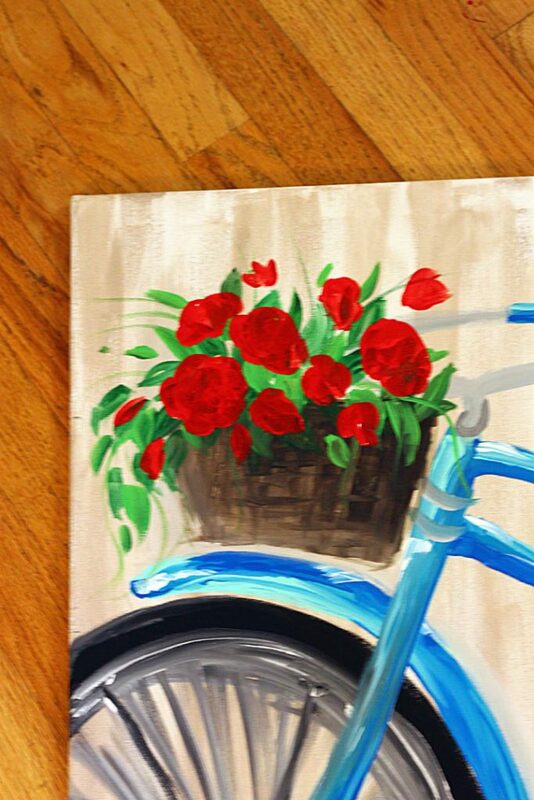 Then brush a crosshatch pattern onto your basket. 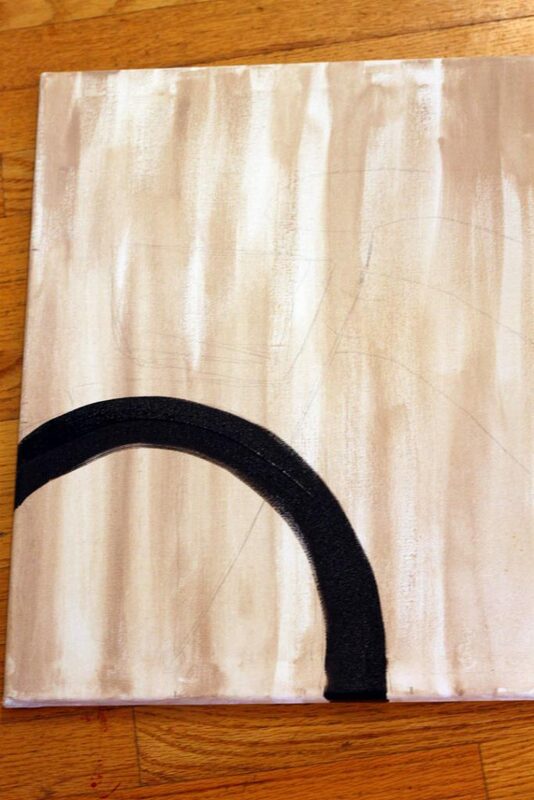 Load some Burnt Umber onto your brush, and shade along the top, and right-hand side of your basket. 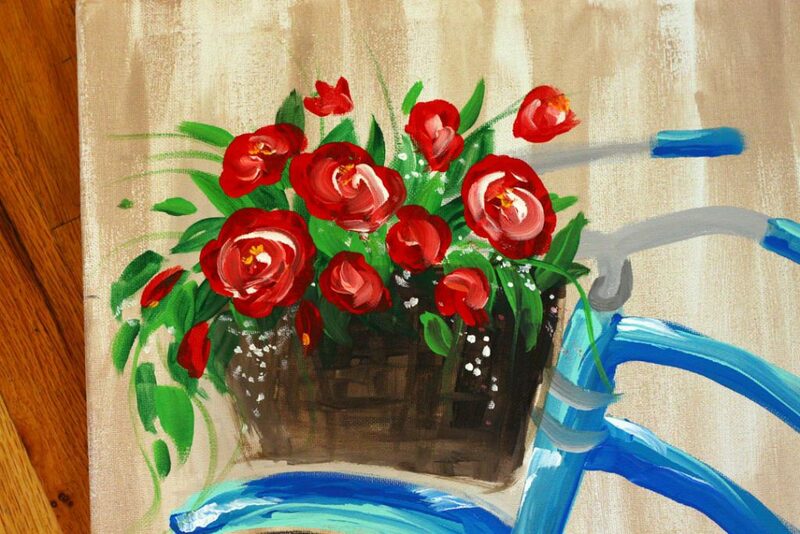 Next, load your 1/2-inch flat brush with Leaf Green and make leaves around the top of your basket, and a few hanging down over the edge. To quick stroke a leaf, try placing your brush flat on the canvas, and then twisting it to the flat edge, as you stroke downward. Practice on a piece of paper first, if your wish, until you are more confident. Be sure to vary the sizes of your leaves. Add more leaves on top with the Irish Moss. 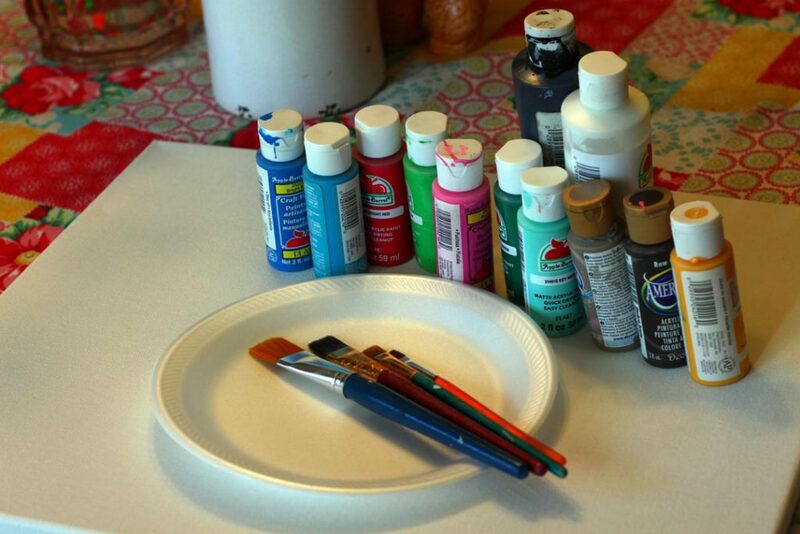 Use the Calico Red to make various sided flower shapes. 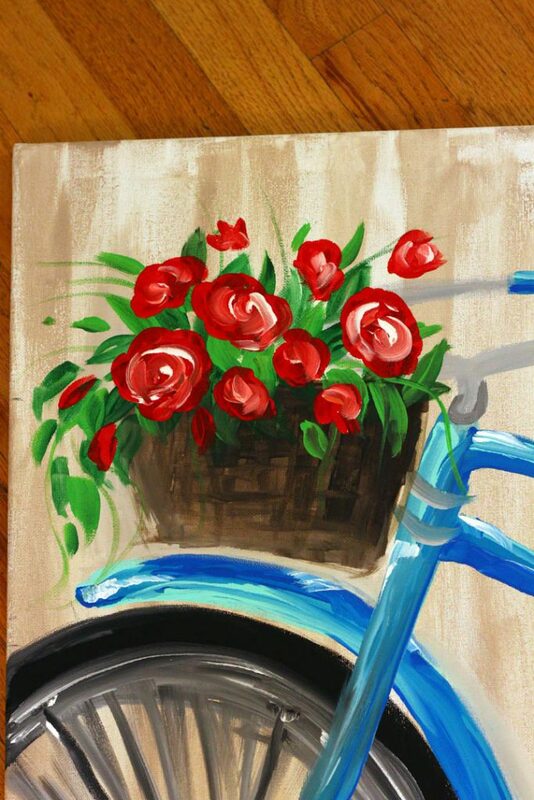 While the red is still wet, load a bunch of white paint onto one of your small flat brushes, and create loose spiral shapes in the center of each flower. Sprinkle small clusters of white dots around, and dab some spots of Saffron Yellow into the center of some of the flowers. Now, sign your masterpiece, and let it dry! 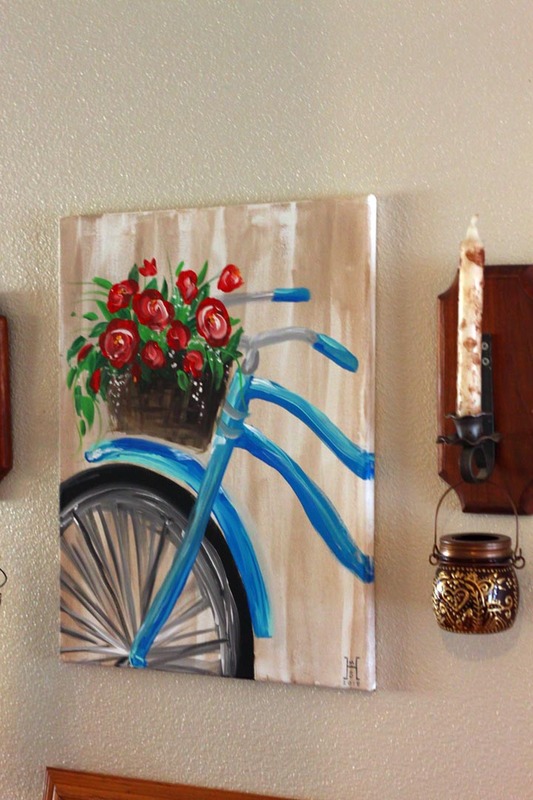 This entry was posted in Painting, Wall Art and tagged DecoArt Americana, DIY Wall art, Painting, Wall Art on July 19, 2018 by Michelle.